Seven years. Thirteen countries. 23,084 km by motorbike, 19,270 km on all types of sea vessels. 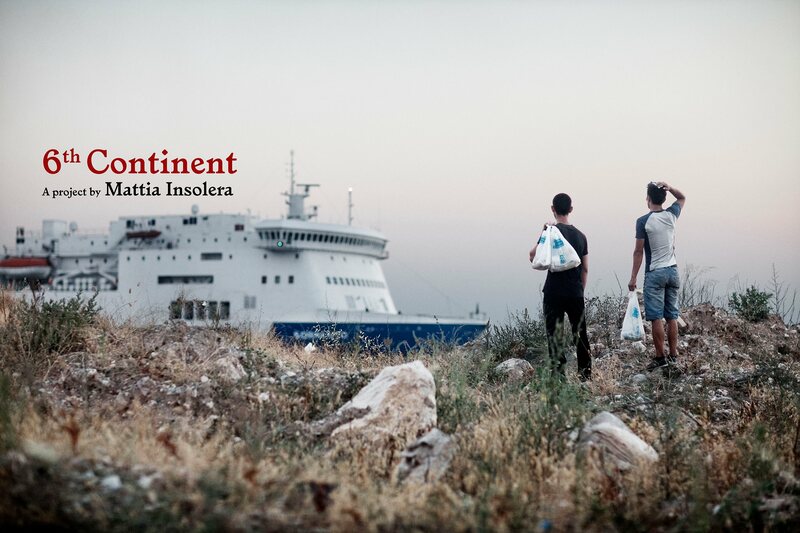 Mattia Insolera’s 6th Continent is an immense and highly poetic photographic project, capturing the essence of the peoples, cultures and migrations of the Mediterranean Sea. Scratching far below the surface of the touristic attractions and postcard landscapes, Mattia’s camera documents a myriad of contemporary realities: shipworkers and fishermen, migrants and traders, ports and markets, rituals and protests. Is the Mediterranean Sea still the place of cultural exchange it has long been celebrated for? Or has it now become more of a hostile border between south and north? What exactly is the ‘Sixth Continent’ ? We interviewed Mattia to get a feel of what his travels and camera lens taught him about this most complex and fascinating of regions. Mattia Insolera has recently launched a crowdfunding campaign to crystallise the 6th Continent project into a beautiful photobook, complete with anecdotes, literary quotes, a precious fold-out map by Giorgio Baravalle, and much more. Click here to learn more, and to offer your support! Hand-drawn map by Giorgio Baravalle. Le monde n’est pas rond. 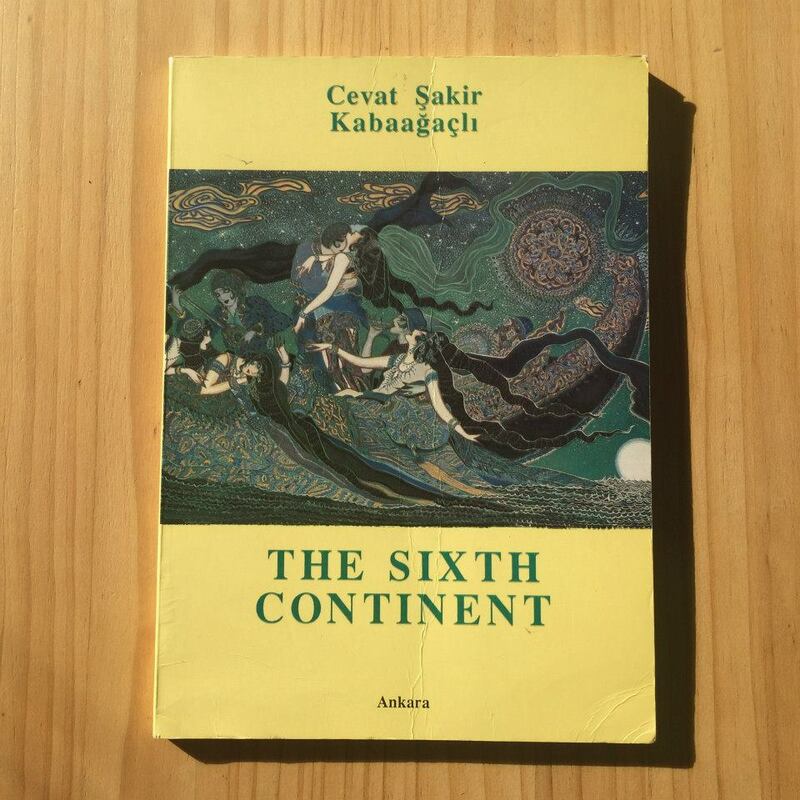 Your 6th Continent project is inspired by Cevat Şakir Kabaağaçlı’s book of the same name, and by Matvejevic’s Mediterranski Brevijar. Could you tell us more about what these works mean to you, and their influence on your photography? Mattia. My first source of inspiration was the Breviary. I was reading it during a sailboat trip that should have taken me and a friend of mine, a skipper, to the other side of the Atlantic Ocean. I was captured by Matvejevic’s narrative and fascinated by the structure of the book. After two weeks of navigation I realised that I was more interested in life on the shore than the mere task of sailing, so I dropped down in the area of Gibraltar and there I began to feel I was inside the pages of that book. It was 2007, and I decided to devote the following years of my life to a comprehensive project about the Mediterranean, and to follow the same structure of Matvejevic’s book. 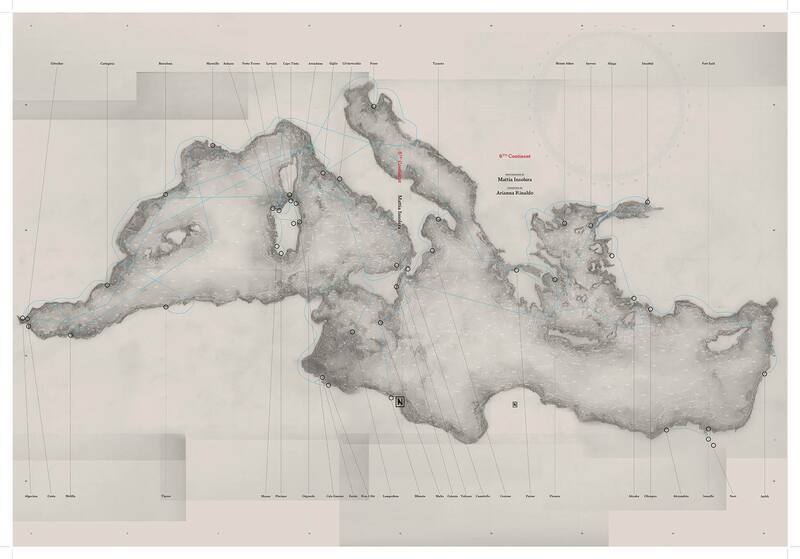 I discovered The Sixth Continent much later, but I recognised immediately that his concept of the Mediterranean perfectly suited my work. He intended the inner sea as a continent apart from the ones categorised by geographers, an area that had the capacity to assimilate people coming from the antipodes of the earth, turning them into Mediterraneans in the matter of a few years. Nowadays not much remains of that Mediterranean, as it has become a barbed-wire fence between the north and the south of the world. Nevertheless I wanted to find out if something remained of that time. Lmnpr. On your journeys across the Mediterranean with your camera, what did you look out for the most, and what were your main objectives? Mattia. My focus was to find people that live the sea as a surface for transportation, a working place, an area of exchanges. Those are the people that still experience living in the 6th Continent. The rest of the people, most of us, just experience it as a touristic attraction. Mohsen Lihideb, the postman of Zarzis, Tunisia, has been collecting in his yard the belongings of hundreds of shipwrecked migrants brought in by the current. Lmnpr. When you visited Mohsen Lihideb’s Sea Memory Museum in Zarzis, which object(s) most grabbed your attention, and why? Mattia. Among the thousands of objects accumulated there, the one that intrigued me the most was an amulet, a little leather bag hanging on a necklace, probably belonging to a Senegalese migrant. It contained a prayer: this gave me an inkling of what a heroic task it is to undertake the sea. Lmnpr. 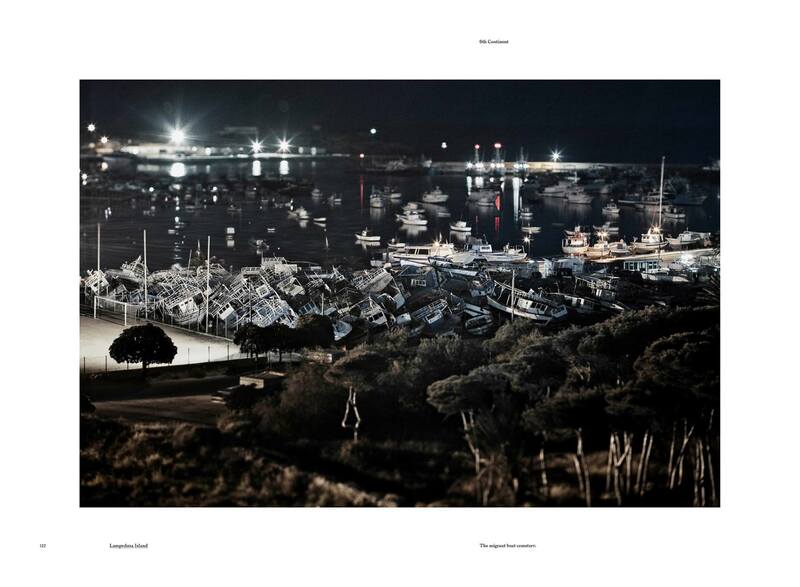 You visited Lampedusa and Malta, and also a number of other, lesser-known islands (Asinara, Imvros…). Could you tell us a little about them, and what led you to visit them? Mattia. I visited different islands for different reasons, and what I found on each one were stories of… isolation! For example I went to Asinara, a deserted island, to document the struggle of a group of laid-off workers that exiled themselves there as a form of protest. I went to Porer, considered the smallest island of the Mediterranean (off the southern cape of Istria, it takes only a minute to walk around it), to meet one of the few remaining lighthouse guards. I went to Imvros to meet the last community of Greeks living in Turkey after the ethnic cleansing that took place in the 60’s. 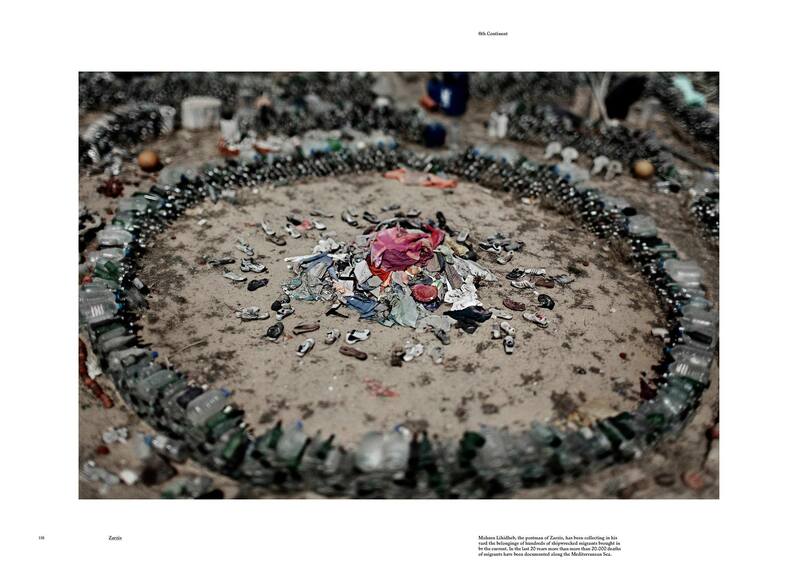 Migrant boat cemetery, Lampedusa. An involuntary monument to the over 23,000 migrants who have lost their lives in the Mediterranean Sea over the past twenty years. Lmnpr. Have you ever had trouble crossing an international border? Mattia. Not really, and that’s what I always think when I travel freely amid the shores of the Mediterranean: I consider myself very lucky because other people proceeding from the south and not having a red passport don’t have this privilege. For them travelling remains a dream, or a dangerous passage that can lead you to death. This entry was posted on 27/12/2014 by mondepasrondeditor in activism, documentary, interview, journalism, photography, visual art and tagged borders, Italy, Lampedusa, Malta, maps, Mattia Insolera, Mediterranean, migration, refugees, Turkey, walls.